Yes it’s that time of year again, when everyone suddenly discovers their Irish ancestry and declares that they’ve always loved a Guinness. We at EP are no different, so we thought we’d celebrate the occasion with a look at our favourite Irish pop stars. Ireland has had a long association with music. The Emerald Isle is known for producing the most winners of the Eurovision Song Contest (7), and so it’s no surprise that it would also be home to many of the world’s most famous (and/or infamous!) singers and pop music acts. Here’s our Top 10. 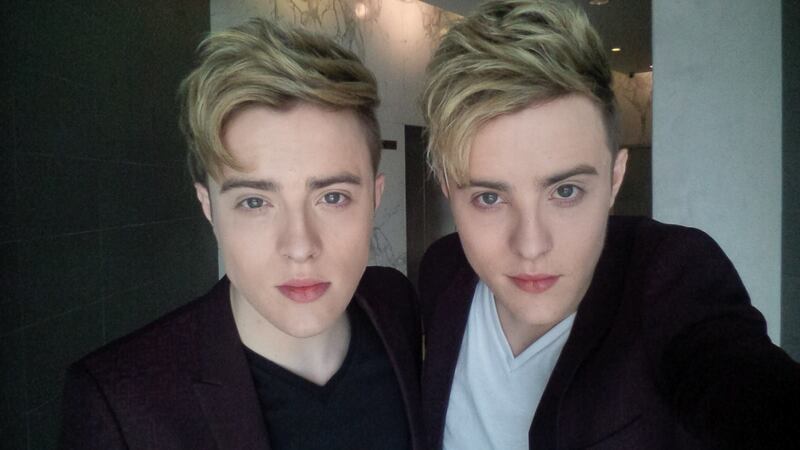 Love them or hate them, when you think of Ireland, you think of Jedward. We love them here at EP, so they had to be on our list. Twins John and Edward Grimes hail from Dublin, and even though these days they’re more likely to be seen in the world’s celebrity hot spots (Los Angeles for example), they have green blood running through their veins, and still call Ireland home. The lovely lads are about to release their fourth studio album sometime this year – we can’t wait! Might seem a bit of a leap from the Jedward twins to Van the Man, but that’s how we roll. A Belfast Boy, the “Van” comes from his middle name, Ivan. Mr Morrison’s real first name is George! Who knew! Most famous for his hits “Moondance” and “Brown Eyed Girl” Van started out in the mid-sixties with his band, “Them” (whose hit, “Here Comes the Night” almost entitles them to a listing of their own) before going solo and releasing his breakthrough album, “Astral Weeks”, voted top Irish album of all time in a poll conducted by Hot Press magazine in 2009. Van the Man’s 1970 classic album, “Moondance” was re-released in September last year, and a book immortalising his song lyrics is due for publication by Faber and Faber. Okay so they’re stretching the “pop act” part a fair bit, but no celebration of Irish music and St Patrick’s Day would be complete without a mention of Phil Lynott and crew. Their history is entwined with Van Morrison and “Them”, as two of the founding members, Eric Bell and Eric Wrixon had previously played with Morrison’s band. Most popular songs include “Whiskey in the Jar” and “The Boys are Back in Town”. It’s a certainty you’ll hear at least one of them at any St Pat’s celebration. Lead singer Phil Lynott died in 1986, but the band still plays these days in various forms, most recently announcing in March last year that they would tour Australia (where they are still very popular due to the large Irish ex-pat population). Again, not so much Pop as Rock, but our strapline is “Pop essentials and a little bit more” so we’re including them. Think Boomtown Rats, and you automatically think “I Don’t Like Mondays” and Band Aid/Live Aid. Lead singer Bob Geldof is better known these days for his ratty hair than his music, but “Sir Bob” was a mover and a shaker in the 80s and led the charge (with Ultravox’s Midge Ure) to feed the starving during Ethiopia’s famine. The Rats announced a few days ago that they would perform in “The Rock Against Cancer” – an annual cancer fundraising event put on in the tiny Wiltshire UK village of All Cannings. Sinead O’Connor, has a beautiful singing voice most famously heard in her best-known song, “Nothing Compares 2 U”. From her second studio album, “I Do Not Want What I Haven’t Got” the video features a close up of O’Connor’s face spliced with footage of her walking through Paris, where it was filmed. Sinead’s tears towards the end are the most remembered part though, and the singer says they were unplanned, but were brought on by the lyrics, “All the flowers that you planted, Mother/in the back yard/All died when you went away”, due to her complex relationship with her mother. Sinead O’Connor has been in the news in recent months with her Open Letter to Miley Cyrus last October, in response to Miley saying that the video for her song “Wrecking Ball” was based on O’Connor’s “Nothing Compares 2 U”. After a war of words between the two (as well as fellow artist, Amanda Palmer, among others), Ms O’Connor has most recently performed at Dublin’s famous Olympia Theatre just hours after having surgery for kidney stones! Another stretch, but we have to include The Pogues. Okay, they’re dyed-in-the-wool punk to the very dodgy back teeth of lead singer Shane MacGowan, and they aren’t even officially Irish as they were formed in London, but their members mostly are, so they’re here. Famed for their use of the tin whistle and other traditional Irish instruments, including the cittern, mandolin and accordion, the Pogues’ most famous song is “Dirty Old Town”, which is another you’re guaranteed to hear played this weekend. The Nolans! Who can forget “I’m In the Mood for Dancing” from 1979! It made Number 3 in the UK, Number 2 in Ireland, and Number 1 in, of all places, Japan! Known for their co-ordinated dance moves, not to mention spandex, the sisters have been struck by tragedy in recent years, with Bernie Nolan dying earlier this year from cancer. Boy Band Westlife formed in 1998 and disbanded in 2012, with two farewell concerts at Dublin’s Croke Park in June that year. They were most popular in Ireland and the UK and had 12 world tours. Most famously they played for the Sultan of Brunei, earning a staggering 2.5 million pounds to perform seven songs in a private concert. Including 14 number one UK singles, they made the UK top ten a total of 26 times in their 14 year career. Since disbanding, the members have continued in the music industry, with moderate success. Brian McFadden left the group in 2004. What can be said about U2 that hasn’t been said before. They are our number 1 because they epitomise the Irish popular music industry in recent history! Formed in 1976, the group have pretty much embraced all musical genres, and so are definitely worthy of inclusion in our list. Highlights of their nearly 40-year career include their involvement with fellow Irishman Bob Geldof’s Band Aid project and their other humanitarian efforts (Bono founded “(PRODUCT) RED” in 2006, with profits going to The Global Fund. He is also co-founder and spokesperson for ONE Campaign). Best known for their anthemic and often political songs, they are unusual in having remained together for such a long time with their original lineup. U2 were nominated for an Academy Award this year for their song, “Ordinary Love”, from the soundtrack to the biopic, “Mandela: Long Walk to Freedom”. The band performed it at the ceremony. So there you have it! Honourable mentions must go to Aslan, The Cranberries, B*Witched, and Boyzone, who would definitely have been included if we’d made a top 20 list! Previous Previous post: Spice Up Your Life…with Pizza?